Patricia C. Kelley is a paralegal with the firm of Govier, Katskee, Suing & Maxell, PC, LLO, where she works directly with Pamela Hogenson Govier. 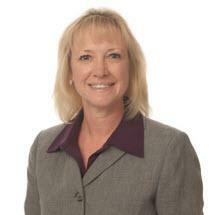 Ms. Kelley has over 35 years of legal experience, where her primary focus has been litigation and family law. She works closely with clients; manages cases; drafts pleadings and documents; coordinates with opposing counsel and the courts; manages discovery; and prepares for and assists at depositions, hearings, and trials. Ms. Kelley is also a mediator, specializing in family law, high conflict and domestic abuse cases. She has been a mediator since 1998, and works with parents in divorce and paternity cases in Douglas and Sarpy Counties to develop Parenting Plans to resolve custody, visitation and other parenting issues. Ms. Kelley has served on the board of the Nebraska Mediation Association, and has worked on many committees regarding dispute resolution. She received the 2016 Outstanding Member award from the Nebraska Mediation Association. Ms. Kelley is a frequent speaker at educational seminars, paralegal schools, and colleges on the subjects of paralegal practice and mediation. Frequent speaker at educational seminars, paralegal schools, and colleges on the subjects of paralegal practice and mediation.